Is Maximum Conservative Management an Equivalent Treatment Option to Dialysis for Elderly Patients with Significant Comorbid Disease? Background and objectives: There is ongoing growth of elderly populations with ESRD in Western Europe and North America. In our center, we offer an alternative care pathway of ‘maximum conservative management’ (MCM) to patients who elect not to start dialysis, often because of a heavy burden of comorbid illness and advanced age. The objective of our study was to compare clinical outcomes for patients who had ESRD and chose either MCM or renal replacement therapy (RRT). Design, setting, participants, & measurements: This is an observational study of a single-center cohort in the United Kingdom that evaluating 202 elderly (≥70 yr) patients who had ESRD and had chosen either MCM (n = 29) or RRT (n = 173). We report survival, hospitalization rates, and location of death for this cohort. Survival was measured from a standardized ‘threshold’ estimated GFR of 10.8 ml/min per 1.73 m2. Results: Median survival, including the first 90 d, was 37.8 mo (range 0 to 106 mo) for RRT patients and 13.9 mo (range 2 to 44) for MCM patients (P < 0.01). RRT patients had higher rates of hospitalization (0.069 [95% confidence interval (CI) 0.068 to 0.070]) versus 0.043 [95% CI 0.040 to 0.047] hospital days/patient-days survived) compared with MCM patients. MCM patients were significantly more likely to die at home or in a hospice (odds ratio 4.15; 95% CI 1.67 to 10.25). A survey of the literature describing elderly ESRD outcomes is also presented. Conclusions: Dialysis prolongs survival for elderly patients who have ESRD with significant comorbidity by approximately 2 yr; however, patients who choose MCM can survive a substantial length of time, achieving similar numbers of hospital-free days to patients who choose hemodialysis. Although the overall incidence of ESRD in Western Europe and North America seems to have leveled off in recent years, this trend has not been seen for people who are older than 65 yr. Among the elderly, there is ongoing growth of incident and prevalent ESRD populations as well as a steady increase in rates of acceptance of the elderly onto dialysis programs (1–3). Increased longevity, coupled with technical advances and heightened public expectation, has contributed to an unprecedented increase in demand for dialysis therapies in older age groups (2). The burden of comorbid disease is higher in this group of patients (4) and has been clearly shown to affect survival (5). For a select group of elderly patients with a heavy burden of comorbid illness, although dialysis may be technically feasible, the short-term mortality is often very high, particularly in those with advanced cardiovascular disease and/or diabetes (6). Transportation to and from hemodialysis units is often an all-day affair for patients with limited mobility, leaving very little time for other activities on hemodialysis days. Emotional investment of both patients and health care staff in the life-prolonging nature of renal replacement therapy (RRT) may result in unnecessary medicalization of death, manifest by invasive tests, procedures and hospitalizations whose benefits are marginal at best (7). Previous authors have suggested that dialysis patients are more likely to die in hospital rather than at home or in hospice (8,9). A growing number of nephrology programs in the United Kingdom are offering ongoing follow-up and multidisciplinary support to patients who have ESRD and choose not to start dialysis. It has been variously described as ‘conservative management,’ ‘maximum conservative management’ (MCM), nondialysis treatment, and ‘palliative renal care’; however, little information on patient outcomes is available. There has been increasing interest in recent years in quantifying the survival benefit offered by dialysis therapies to elderly patients with ESRD and a heavy burden of comorbid disease (10,11). The objective of our study was to compare clinical outcomes for a single-center cohort of 202 elderly (≥70 yr) patients who had ESRD and chose either MCM or RRT. We describe survival, hospitalization rates, and location of death for this cohort. The Royal Free Hospital is a referral center for renal patients from north London, serving a catchment population of 1.2 million people. Patients with an estimated GFR (eGFR) ≤30 ml/min per 1.73 m2 are reviewed in the ‘Low Clearance Clinic’ and provided with information regarding both RRT and MCM as therapeutic options. We identified and followed all patients who started dialysis (RRT) and were ≥70 yr of age at the time of first dialysis treatment in our center between January 1, 1997, and December 31, 2003. This included both patients who had been referred to a nephrologist and started dialysis in a planned manner and those who started dialysis as an emergency because of either very late referral (so-called ‘emergency referrals’) or acute renal failure. Similarly, we followed all patients who were identified through our Low Clearance Clinic and chose MCM from January 1, 1997, onward. Patients were followed until death or study end date (November 22, 2005). Patients were censored at the time of renal transplantation, transfer to another center, loss to follow-up, or study end. All patients were reviewed by a multidisciplinary team that included a nephrologist, clinical nurse specialist, dietician, and social worker. Families were invited to participate in all discussions about dialysis initiation. The only difference in counseling received by the two groups was that patients who chose MCM were also visited once at their homes by the clinic social worker to offer additional support and opportunity for the patient and the family to discuss the treatment plan. Patients were informed that with MCM, their current functional status could be maintained until close to death, according to our previous study showing preservation of Karnofsky score in patients with MCM (12). All patients were offered ongoing specialist follow-up in the clinic and hospitalization if necessary. Hemoglobin was optimized for both groups using erythropoietin and intravenous iron, maintaining a target >110 g/L. BP and cholesterol management was similar for both MCM and RRT patients. For MCM patients only, calcium and phosphate balance was focused on symptomatic treatment to control pruritus, rather than Kidney Disease Outcomes Quality Initiative (K/DOQI) targets; fluid overload was treated with loop diuretics; and dietary input was limited to potassium restriction. End-of-life care, including access to hospice and home palliative care, was discussed with all patients who chose not to undergo dialysis, and arrangements were made in accordance with individual wishes. We used the four-variable modified Modification of Diet in Renal Disease (MDRD) formula to calculate eGFR for each measurement of serum creatinine (13). Baseline Charlson Comorbidity Index (CCI) and age-adjusted CCI score, which has been previously validated in patients with ESRD (14), was calculated for each patient as of dialysis initiation using a template Excel spreadsheet (15). To assess survival in our RRT and MCM patients from a comparable starting point, we performed an individual regression analysis of eGFR versus time for each RRT patient to calculate a ‘threshold eGFR’ on the day of dialysis initiation. If a valid regression was not possible (either eGFR was trending toward improvement before dialysis, there was no significant trend on the regression (r2 < 0.3) or there were fewer than three creatinine measurements within 5 yr of starting dialysis) we used the closest single eGFR within 7 d of dialysis initiation. The overall median ‘threshold eGFR’ was then determined for the RRT group. We then calculated a ‘putative dialysis initiation’ (PDI) date for each MCM patient by performing individual regression analyses to determine the date on which each MCM patient's eGFR reached the median threshold eGFR for the RRT group. MCM patients who presented to our outpatient clinic with an eGFR less than that threshold eGFR were assigned the date of their first nephrology consultation plus 7 d as their PDI date, to reflect the time that would typically be required to arrange nonemergency vascular access and arrange a new hemodialysis start in our unit. Patient survival and hospitalization were measured from the date of first dialysis for the RRT cohort and from the PDI date for the MCM patients. We compared baseline characteristics using a t test for continuous variables and the χ2 test for categorical variables. The Mann-Whitney U test was used to compare baseline CCI scores. Odds ratios (ORs) and confidence intervals (CIs) for the likelihood of death in hospital versus in hospice were calculated from contingency tables. Survival was analyzed using Kaplan-Meier product limit method, and the median survival was calculated using life tables. Significance was evaluated using Log-rank test. Statistical calculations and analyses were performed using STATISTICA 6.0 (StatSoft, Tulsa, OK). Patients were identified and included into the study from January 1, 1997, through December 31, 2003. Of the 611 patients who started RRT, 179 (29%) who were aged ≥70 yr at the time of first dialysis treatment were identified (Figure 1). Six of the RRT patients, all with acute renal failure, recovered enough renal function to come off dialysis and were excluded from the analysis. One of these patients subsequently chose MCM. The RRT cohort was compared with 37 patients who had chosen MCM. Of these, two were younger than 70 yr at the date their eGFR fell below the dialysis threshold. Six had not yet reached the threshold eGFR and for the purposes of the study were considered not to have ESRD. These patients were also excluded from the analysis. Flowsheet of all incident dialysis patients who were aged ≥70 yr and patients who opted for MCM, showing outcomes, exclusions and patients who were lost to follow-up. Baseline characteristics of the study patients are shown in Table 1. The mean age of the RRT patients was 76.4 yr, whereas the MCM cohort was slightly older at 81.6 yr (P = 0.00001). Neither gender distribution (31% female in RRT versus 41% in MCM; NS) nor diabetes status (29 versus 14% respectively; NS) was statistically different between the groups. Both unadjusted and age-adjusted mean CCI scores were not different between the two groups (RRT 4.0 and 7.2 age-adjusted versus MCM 3.7 and 7.4 age-adjusted; NS). The patients in both groups were predominantly white (77% RRT versus 72% MCM; NS). The median threshold eGFR at which the RRT patients started dialysis was 10.8 ml/min per 1.73 m2. The timing of nephrology referral in both groups was similar, with just more than half of the patients in both groups (53% RRT versus 52% MCM; NS) receiving >120 d of nephrology care (‘early referral’) before dialysis or putative dialysis start. The distribution of dialysis modalities used by the RRT patients is outlined in Table 1. Hemodialysis was the initial modality choice for 69% of the RRT patients. Clinical outcomes are summarized in Table 2 and Figure 2. The median unadjusted survival for RRT patients was 37.8 versus 13.9 mo for MCM patients (P < 0.01). After exclusion of the first 90 d of dialysis (or after PDI for the MCM patients), survival in both groups improved to 41.9 and 14.8 mo, respectively (P < 0.001). Because all of the MCM patients were identified in an outpatient setting, it could be argued that it would be inappropriate to compare them with emergency referral RRT patients, who presented in extremis and required acute dialysis; therefore, RRT subgroup analysis was performed for 121 ‘nonemergency referral’ and 52 emergency referral patients who required dialysis within 14 d of initial nephrology care. Median unadjusted survival for the nonemergency referrals was 41.5 mo, improving to 43.0 mo (versus 21.7 mo, improving to 25.8 mo for emergency referrals; NS) when the first 90 d on dialysis were excluded. Kaplan-Meier survival curves. (A) MCM versus all RRT (from day 0). (B) MCM versus all RRT (from day 90). (C) MCM versus RRT emergency referral subgroup versus RRT nonemergency referral subgroup (from day 0). RRT patients were hospitalized more frequently than those in the MCM cohort. The mean rate of hospitalization from any cause in the analyzed period was 0.069 (95% CI 0.068 to 0.070) hospital days per patient-days survived (25 d per patient per year) for the RRT group versus 0.043 (95% CI 0.040 to 0.047) hospital days per patient-days survived (16 d per patient per year) for the MCM group. This difference remained significant in subgroup analysis of the nonemergency referral RRT patients who started dialysis after >14 d of nephrology care (0.062; 95% CI 0.060 to 0.063). After exclusion of the first 90 d on dialysis, the rates of hospitalization were unchanged and amounted to 0.065 (95% CI 0.064 to 0.066) for all RRT patients versus 0.042 (95% CI 0.038 to 0.045) for MCM cohort. Patients who chose MCM had a four-fold greater chance of dying at home or in a hospice than those in RRT cohort (OR 4.15; 95% CI 1.67 to 10.25). We also analyzed the subgroup of 112 RRT patients who remained on hemodialysis throughout the study, to estimate the ‘time lost’ to hospital admission, dialysis-related travel, treatment, and posttreatment fatigue (Figure 3). Patients who were on peritoneal dialysis at any time during the study were excluded from this subgroup analysis. 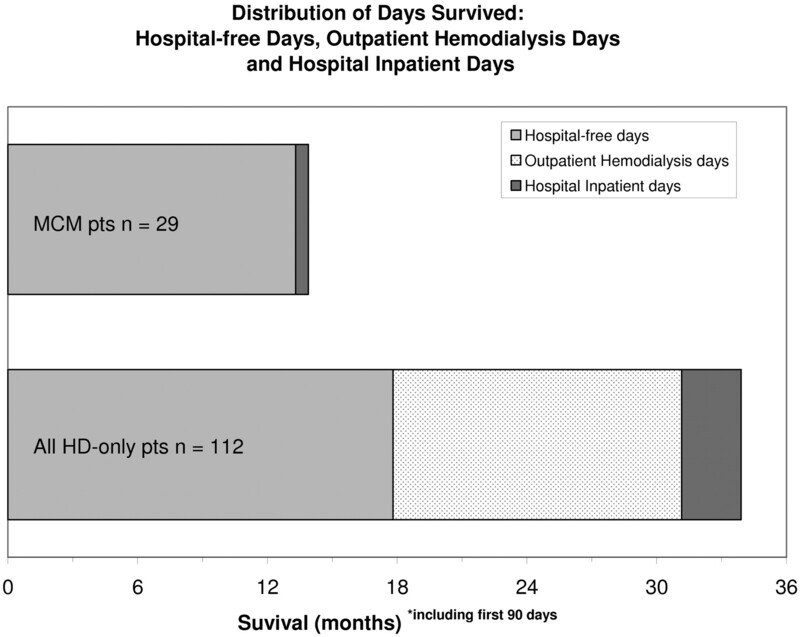 Hemodialysis-only patients spent 47.5% of the days they survived at or in the hospital (173 d per patient per year) versus MCM patients, who spent 4.3% of the days they survived at or in the hospital (16 d per patient per year). Median survival for MCM cohort and the hemodialysis-only subgroup in the RRT cohort. Data shown are how many days were spent hospital-free, compared with in-patient stays in hospital and outpatient hospital attendances for dialysis. Nephrologists and primary care physicians report withholding dialysis from 7 to 25% of patients with ESRD because age, extensive comorbidity burden, impaired mental capacity, and poor quality of life (8,16,17); however, there is scarce information about outcomes for patients who have ESRD and do not start dialysis, making it very difficult to provide patients with accurate information about MCM as a treatment choice. In our cohort of elderly (age ≥70 yr) patients who chose either to start dialysis or receive MCM, the MCM patients were older (median age 81.6 versus 76.4 yr), and we previously noted that they were more likely to be married (12). Surprising, neither the burden of comorbid illness as assessed by the CCI nor the prevalence of diabetes was significantly different between the groups. This suggests that although comorbidity has a major effect on physician recommendation for conservative management (18), it is less important in patient decision-making regarding initiation of dialysis. There was no difference in the proportion of patients in each group who were referred to a nephrologist early (>120 d before dialysis initiation or PDI), so there was equal time for patients in both groups to receive adequate information and counseling before choosing dialysis versus a conservative management pathway. No patient crossed over from the MCM to the RRT group at the last minute, further suggesting that patients and families were well prepared and fully informed about their treatment options. Ethnicity, baseline hemoglobin, serum albumin, and total cholesterol levels were also not different between the groups. The overall median survival for the RRT cohort, measured from the date of dialysis initiation, was longer at 37.8 versus 13.9 mo for the MCM patients. This difference in median survival was even greater when the first 90 d on dialysis (or post-PDI) were excluded and when only nonemergency referral patients were compared with the MCM group; however, MCM patients who elected never to start dialysis commonly survived ≥1 y, which contrasts sharply with previously reported mean survival of 8 d (range 2 to 46 d) for patients who initially opted for dialysis and subsequently elected to withdraw from treatment (19). This has profound implications in deciding between pursuing a trial of dialysis versus MCM for elderly patients who have significant comorbidity and their physicians. This study adds to the very small number of published reports that have quantified survival in patients who had ESRD and did not receive dialysis (6,8,9,11). A survey of the literature that reported survival in elderly patients who had ESRD is shown in Figure 4. The first study to compare survival in octogenarians who underwent conservatively management versus dialysis reported a median survival of 28.9 mo in RRT patients compared with 8.9 mo in the conservatively managed cohort (11). Smith et al. (8) examined an all-ages cohort of patients who had advanced chronic kidney disease and were reviewed in a multidisciplinary clinic. Ten patients who had been recommended for palliative therapy but who opted for hemodialysis survived a median of only 8.3 mo, compared with the 26 patients who chose conservative management, who survived for a median of 6.3 mo. More recently, another UK study reported survival in a clinic-based cohort of patients with an eGFR ≤15 ml/min per 1.73 m2, based on an intention-to-treat analysis of patients for planned conservative or dialysis management (6). Median survival was approximately 22 mo in their MCM cohort, measured from a higher eGFR starting point (15 ml/min) than for our patients. 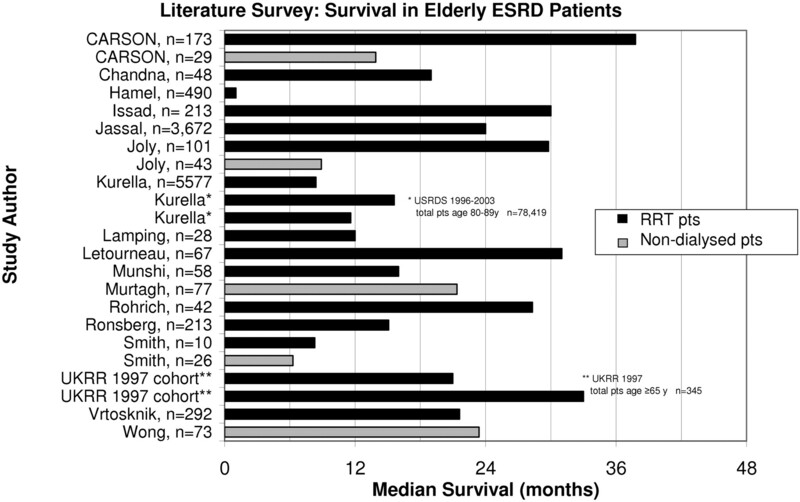 Literature survey: Summary graph of survival of elderly patients with ESRD in previous studies. The burden of hospital admission (for any reason) was significantly higher in our RRT patients than in those who chose MCM. Overall, RRT patients spent on average 6.9% of the days they survived (25 d per patient per year) as hospital inpatients, which is similar to three studies that described incident 90-d survivor RRT patients who were aged >80 yr (20), incident peritoneal dialysis patients who were aged >75 yr (21), and RRT patients who were aged ≥70 yr; had survived >90 d (22); and were hospitalized for 35, 19, and 20 d per patient per year, respectively. Elderly patients on hemodialysis report that their entire day is often taken up traveling to and from dialysis and undergoing the treatment itself. The elderly patient may arrive home too fatigued to eat before retiring to bed (23). In this context, we hypothesize that a similar number of hospital-free days survived between the MCM and the hemodialysis-only subgroup may represent a much smaller difference in quality of life than would be expected from the quantitative overall survival difference. We also measured a surrogate for the ‘medicalization of death’ by determining where patients died. RRT patients were more likely than MCM patients to die in a hospital setting. These rates were very similar to the only other published studies that detailed location of death, which reported that 73% of dialysis patients died in hospital compared with 29 to 35% of renal palliative care cohorts (8,9). This study has several limitations. Our MCM cohort is of modest size, which may limit the generalizability of our results. We made the assumption that clinical deterioration would closely follow deterioration in the eGFR, which may not be true for all patients (24). Although the groups seemed similar, the CCI may be inadequate to detect baseline differences in prognosis between the RRT and MCM patients. Although we attempted to eliminate lead time bias in our comparison of survival and used the four-variable MDRD equation, which has been shown to be the best available prediction equation for low GFRs (25), it has not been specifically validated in this age group. We did not investigate the role of psychosocial characteristics, symptom burden, quality of life, or comorbidity in patients' decisions to opt out of RRT. Characterization of the families' opinion of the death experience and the reasons for and timing of hospitalization for MCM patients are also areas that require further research. The growing literature surrounding end-of-life care in renal patients has been largely centered around advanced care planning for patients who are established on dialysis and symptom control in palliative care of patients who have withdrawn from dialysis (19,26–40). The next step in improving care for patients with kidney failure is to discuss initiation of dialysis (versus MCM) earlier. Our study adds to the evidence that MCM patients may survive for significant periods of time with multidisciplinary, nondialysis care. In the United States, the 1972 Congressional decision to publicly fund dialysis for most patients through the ESRD Medicare program regardless of their private insurance status has contributed to the public perception that pursuing dialysis is nearly always in the patient's best interest. In cases in which the benefits of dialysis are unclear, the prevailing advice from policy makers and opinion leaders has been to consider a trial of dialysis (32). Our results suggest that for some patients, this approach may actually result in shorter survival than declining RRT altogether and following an MCM pathway. Rather than raising the specter of imposing a cost-saving age cap on dialysis, our approach aims to support patient choice. Inclusion of patients who have advanced ESRD and are actively undergoing MCM in national databases such as the UK Renal Registry and the US Renal Data System would greatly facilitate further research into prognosis and decision making for the increasing numbers of elderly patients who have ESRD with significant comorbid illness. Although studies have examined nephrologists' choices regarding whether to offer dialysis (17,18,41,42), future work needs to consider patient decision making. Our results show that for patients with an already limited life expectancy, the so-called medicalization of death is substantially greater with dialysis than without it. We believe that the principles and practice of this treatment pathway should be developed and presented to patients as a third option that falls between dialysis and exclusively palliative care. We acknowledge the contribution of the Low Clearance Clinic staff, specifically B. Williams and S. Johnston. You are going to email the following Is Maximum Conservative Management an Equivalent Treatment Option to Dialysis for Elderly Patients with Significant Comorbid Disease? 103-year-old on dialysis: was it worth it? Does the Evidence Support Conservative Management as an Alternative to Dialysis for Older Patients with Advanced Kidney Disease? Should an Elderly Patient with Stage V CKD and Dementia Be Started on Dialysis? Informing Our Elders About Dialysis: Is an Age-Attuned Approach Warranted?